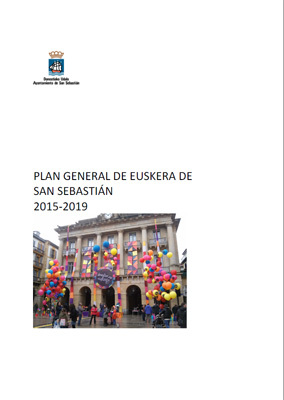 The General Plan for the Basque Language in San Sebastian will guide language planning at the San Sebastian City Council for the period 2015-2019. Said plan envisages the measures proposed for the City Council language policy, taking advantage of the strengths observed in evolution of the Basque language and correcting its weaknesses in order to continue normalising the language. The main objective of the plan is to make headway with total recovery and dissemination of the Basque language in San Sebastian, acting within the powers of the City Council, in coordination and collaboration with the other bodies intervening in the process of language normalisation. It also seeks to boost use of the Basque language, offering the people of San Sebastian conditions for living in Basque, fostering awareness of the language and attracting those who do not know the language to start speaking it.